People living in rural areas in Mallorca do not always have everything available to them. Some fincas do not have mains electricity connected, or telephone, water, sewage, or Internet, you name it. In such circumstances, it is vital to learn how to deal with limited resources and to acquire skills of, for instance, husbandry of energy. Luckily, an island such as Mallorca, in the middle of the Mediterranean Sea, is frequented by a fair amount of wind. 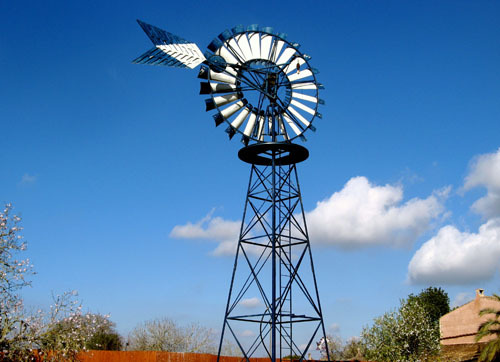 Wind can become a valuable source of alternative energy when converted into mechanical use, as was done in this case where wind helps to bring up water from an underground source. Windmills have been used for farm irrigation for a couple of centuries by now, here in Mallorca. The photo was taken in Son Negre, near Felanitx, Mallorca, Spain. The date: January 20th, 2008. The time was 14:27:55.